Digital fabrication is poised to change architectural design by delivering new modalities of design, practice, and project delivery. Virtual and physical spaces, objects, and designs are on a converging path. Understanding the skillset inherent to this intersection is key to engaging in opportunities and developing designs that are not driven by, but inspired through the use of digital fabrication. Connecting fabrication to a 3D Building Information Model further employs virtual geometry to expand the project scope, communication, complexity, and enhance the design process. 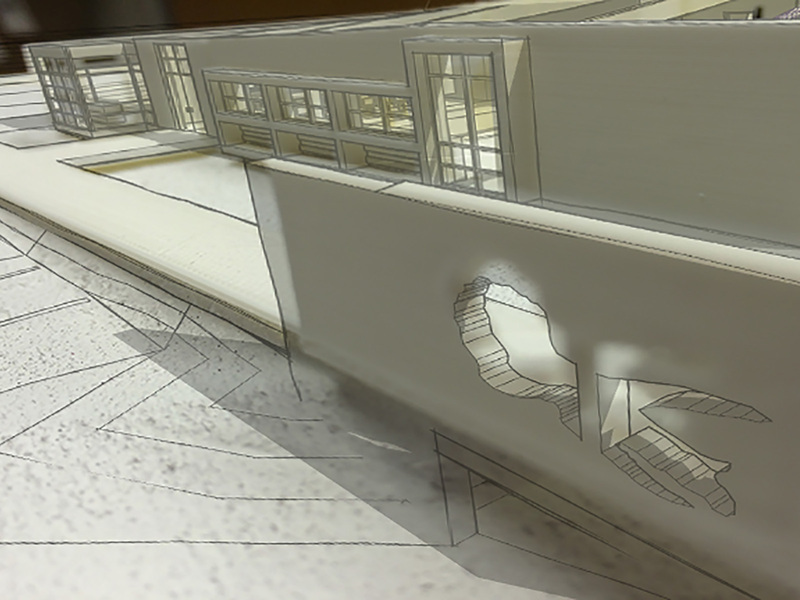 BIM model of a small museum building. Launching into fabrication requires at its core, well-constructed 3D geometry in the virtual space to generate quality physical models. Designers must create clean (void of any geometry that might not be visible in the interface, but may be fabricated) and water tight (geometry that can be analyzed to determine an inside and outside to create a tool path for either additive or subtractive manufacturing) 3D models. It also requires 3D software capable of assisting the designer with this process, automatically creating clean joints, precision modeling, and a toolset that inherently helps build complex connections. While I often see fabrication errors due to poor modeling caused by both the designer and the software used, it is extremely rare that I see either error with Revit. The depth and technicality of Revit itself offers opportunities with fabrication that generate success for my most entry-level students just starting 3D modeling and digital fabrication. 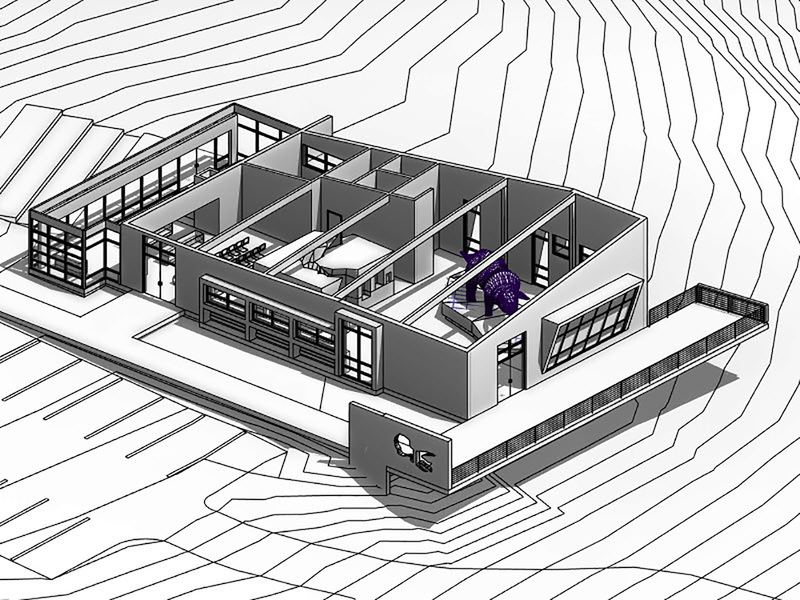 The modeling process within Revit helps craft greater depth and purpose from a BIM model increasing the potential scope of uses for the virtual geometry. In particular, Revit acts as a central hub in a design process that can include: cost and constructability, visualization, project management, construction documentation, interactivity, simulation, and digital fabrication. Understanding how to effectively leverage a variety of opportunities from a single BIM model helps manage the conflict between two modes of design thinking: Analytical and Visceral. For instance, form can be explored through digital fabrication on the same model at the same time that the design is undergoing simulation analysis. This mode of parallel work allows the balance of instinctual, or visceral design thinking (how something makes us feel) with the necessity to analyze and improve the capabilities of how something should technically perform. Building an early understanding of these opportunities during the design education process can improve critical thinking, problem-solving, and design thinking. In his book, Change by Design, President of IDEO Tim Brown discusses three overlapping courses of a project, describing an, “inspiration space, in which insights are gathered from every possible source; an ideation space, in which those insights are translated into ideas; and an implementation space, in which the best ideas are developed….” Digital fabrication brings the opportunity to engage in the craft of making and iterate physical versions of a design throughout every phase of a creative process. The opportunity to continually output physical forms and objects has very positive ramifications both in building inspiration, and evolving ideation. Adding a digital fabrication process to these first two phases will certainly improve criticality within the design team, and should build a stronger customer value proposition through new forms of communication and education. The implementation space that Tim Brown discusses, however, is an entirely new mode of development for designers outside of the “design-build” business model. Final implementation of the physical forms through digital fabrication of a design has incredible potential to significantly increase project scope, build office backlogs, and construct a bridge toward retail markets previously unimaginable at a wide scale within the design industry. This business space is largely one that does not currently exist, but from an academic’s perspective it is imperative that we train our current students to both grasp the technological elements and pragmatic applications of digital fabrication through implementation. Without developing skillsets for jobs that currently do not exist, opportunities created by the continual advancement of digital fabrication will move to industries outside of architectural design. WinSun, Contour Crafting, Monolite and other companies are aggressively upscaling the 3D printing process to produce full scale construction results. WinSun, who has generated the most headlines in the last year, completed the tallest 3D printed building in Suzhou, China. As a designer, it is not a particularly compelling structure, but the numbers from the project as described in the Washington Post are a significant call to action: a 30-60% reduction in building materials, a 50-70% reduction in construction time, and a 50-80% reduction in labor. If these numbers are even remotely accurate, large scale digital fabrication will generate massive change in the construction industry. The question from my perspective as a designer and educator is: How can we respond to this change, preparing for jobs and industry wide modifications that do not yet exist? Increasing literacy in digital fabrication is one of the first key steps to ensuring the architectural industry moves gracefully through the changes in the next two decades. At the university level, the impacts of the fabrication toolset are being reinforced as a component that directly engages new skills, that favors experimentation over replication, and addresses the use of fabrication in process – not simply for the construction of final models. The goals from this mode of education should be a generation of designers with the ability to work within new markets, who can find expanded formal opportunities, and most importantly: work to improve the way we serve the constituents of our projects by leveraging new opportunities. The term “mass customization” has become synonymous with the modern digital era. The notion of specificity in customization has permeated how we consume entertainment (Netflix), our sense of fashion (Forbes), it may change the performance of what we drive (Local Motors), and it will certainly change what and how we build. Individuality, personalization, and the ability to dramatically adapt to changing circumstances are becoming an expectation of design, but is often something we cannot genuinely meet given the current state of both design and construction. What the immediate future offers, though, is the insight and ability to meet and expand upon architectural design services in the same vein as open source programming. Dynamo, an open source add-in to Revit creates a work flow that integrates parametric procedures into a BIM environment. As an open-source product, the methodology and development of the software has allowed the end user massive opportunity to work like a high end programmer without the need to know how to write a single line of code. In the same way, new modalities of architecture, design and construction will need to emerge that empower the end user to work more closely with a design team to develop adaptive constructs on the fly during operable conditions of spaces. The potential is not just about customizing formality, but the optimization of performance. This raises the level of design value, enforcing the reality that design is a process rather than a product. Given an entrepreneurial outlook, this has the potential to positively expand the scope of work in the design field. Collaborative production, where people have to coordinate with one another to get anything done, is considerably harder than simple sharing, but the results can be more profound. New tools allow large groups to collaborate, by taking advantage of non-financial motivations and by allowing for wildly differing levels of contribution. 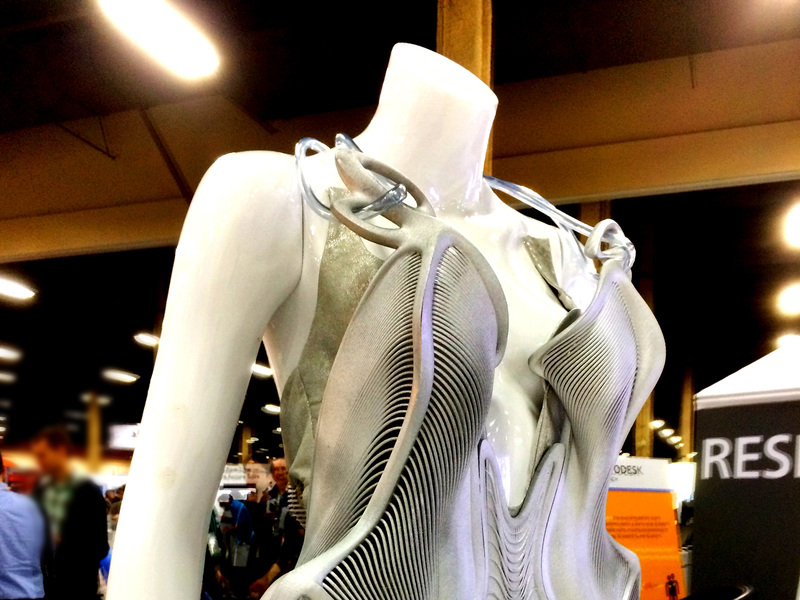 Applying this understanding to digital fabrication provides insights toward its positive use. Effective collaboration between any group of stakeholders requires clarity in communication, the opportunity to express individual ideas, and the construction of empathy for all those involved in the project. As a result, successful collaboration by its very nature must be iterative and needs to evolve with physical objects (in the case of architecture - physical models of buildings and spaces) that provide implicit clarity of design intent. 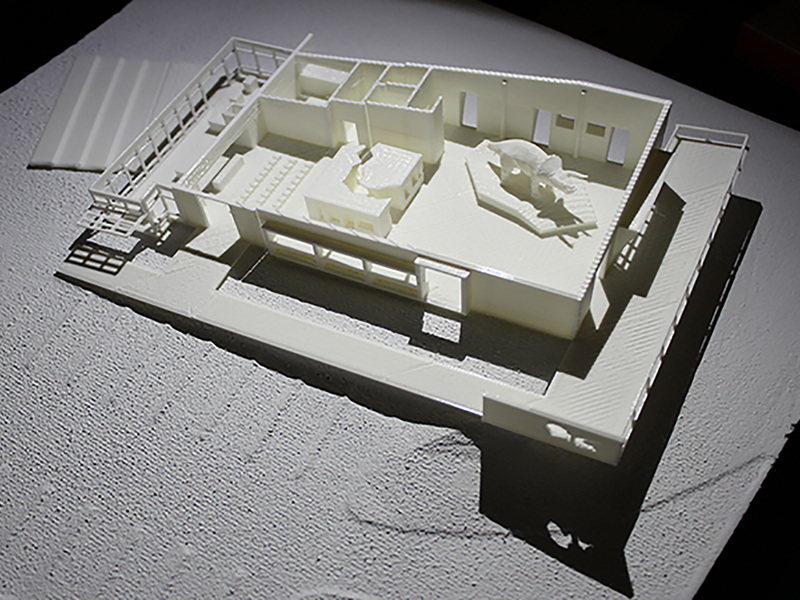 Digital fabrication model of a small museum building. Breaking the 2D barrier of paper, screens, and monitors with a physical model bridges the gap of design understanding. Coupled with virtual reality, construction simulation, and design performance simulations, all from a common BIM model, collaboration will become more intense. As Shirky points out, however, this will build a process that can yield results that are more profound. Within the design community we understand the relevance of our work, but we need to build more profound results to ensure a thriving industry of design professionals. Digital fabrication will be one of the key elements of how we choose to develop our profession, how we engage in the craft of construction, and how we interface with the constituency of our work. To begin learning the emerging toolset of digital fabrication, we have put together a 4 part series titled BIM to Fabrication for Conceptual Design. This series will help begin building the path in your workflow toward the convergence of virtual geometry and physical objects with an emphasis on understanding how to leverage digital fabrication as part of a design process. 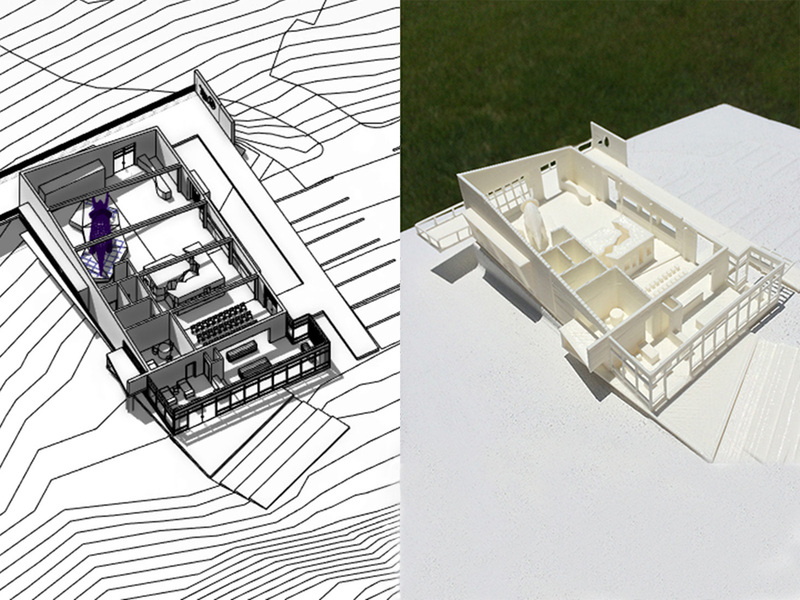 Virtual and physical museum building model side by side. Explore BIM to fabrication further with this project. David R. Beach is an architect and Associate Professor of Architecture at the Hammons School of Architecture at Drury University. Specializing in digital design technology, David is an advocate of full digital immersion as part of a traditional design process leveraging technology to inform process, collaboration, and decision making through analysis. David teaches in the architectural design studios, the Center for Community Studies working at the urban design scale, and both the introductory and advanced digital design technology courses. The application elements of David’s current research can be found at the blog The Architect’s Digital Design Guide, and his YouTube channel, which have over a half million views, and are outlets for work and information directly related to questions received from students and practitioners. David has given 3 presentations at Autodesk University, and has completed over 20 major conference publications and presentations in the last 7 years.